Pelikan first announced their Collectors’ Box, a compact pen chest built to house up to 24 pens, three years ago with expected availability around April of 2015. Production was repeatedly delayed due to manufacturing issues. By late 2016, the boxes were finally making their way into retail channels. You can see my review of that original box here. Unfortunately, that stock was short lived and these again became scarce. As of December 2017, Pelikan announced fresh availability which appears to be more widely distributed and reliable. A close inspection has revealed that this new box is not the same as the original issue. The differences are significant enough that I wanted to provide an update on just what has changed between the two versions. 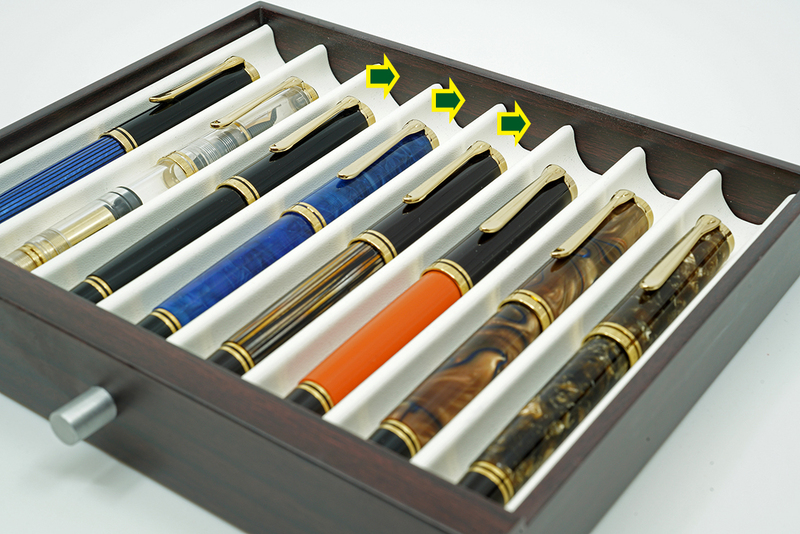 To briefly review, the Collectors’ Box v1.0 was built to accommodate pens up to the M1000 size. The dimensions are a compact 9.8 in W x 8.3 in D x 5.3 in H. The construction consists of medium density fiberboard (MDF) covered with a wooden paper which is protected by a layer of clear lacquer. The three trays (each holding 8 pens) are covered with a cream-colored faux leather and the top of the box is made from 4mm thick safety glass. The bottom of the chest has rubber feet to ensure that the box won’t mar the surface that it’s placed upon. 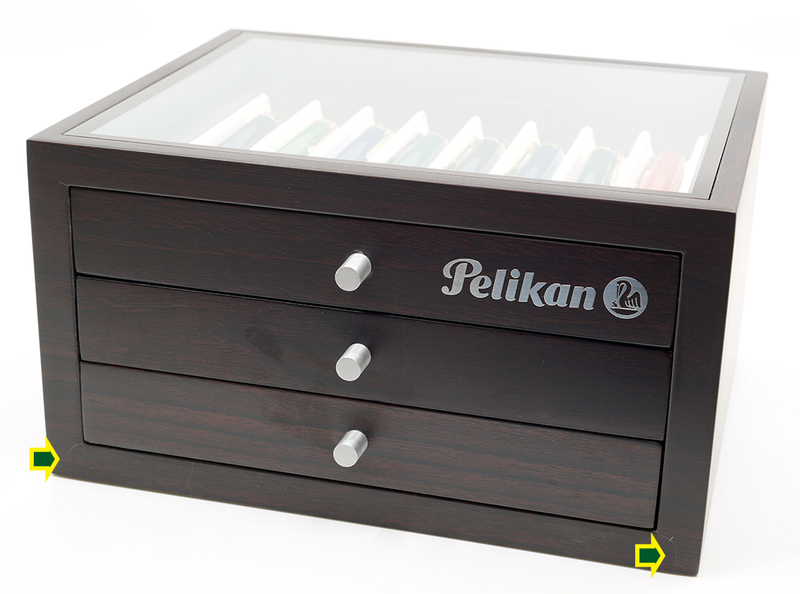 The Pelikan logo is printed on the front of the chest and duplicated on the upper right corner on the back side of the box. Top: v1.0 Collectors’ Box. Note the darker, paper finish and the larger sized Pelikan logo. Bottom: v2.0 Collectors’ Box. The real wood veneer is lighter with more of a reddish hue. The logo is smaller and positioned differently. A close-up of the Pelikan logos demonstrating the difference in size between the two. v1.0 is on top (2.77 x 0.63 inches) and the updated logo is below (2.37 x 0.53 inches). So what new features does the Collectors’ Box v2.0 bring to the table? Most of the changes are subtle and you have to scrutinize the two versions to know what they are as they can be missed with a casual glance. Both boxes retain the same dimensions and overall styling. The most notable change is that the new version is covered with a real wood veneer made from American Walnut versus the wood paper of the first edition. This will likely translate to better durability of the finish. Both are composed of medium density fiberboard (MDF), a high-grade composite material made from recycled wood fibers and resin that is more stable than solid wood and stands up better to changes in heat and humidity. This newer finish has a lighter, more reddish hue and, while I tend to like the darker finish of the first version, I appreciate the better quality and durability of the newer finish. The next big change is the way that the faux leather is placed around the tray. In the first version, the leather only covered the sides of the individual slots, leaving the bare wood of the top and bottom of the drawer exposed. The faux leather now covers the entire tray, an adjustment that will likely better protect the bottom and top of your pens from being scratched. 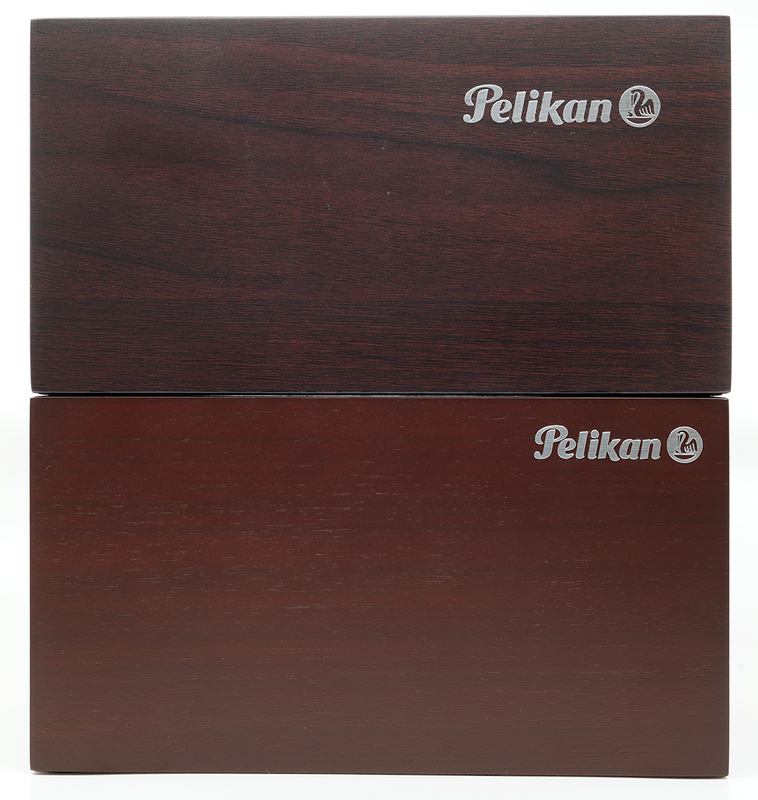 The third difference is the size of the Pelikan logos emblazoned on the front and back of the chest. The original version has a logo that measures 2.77 x 0.63 inches whereas the new logo is a trim 2.37 x 0.53 inches. The remainder of the components such as the plexiglass top and the drawer pulls remain unchanged. 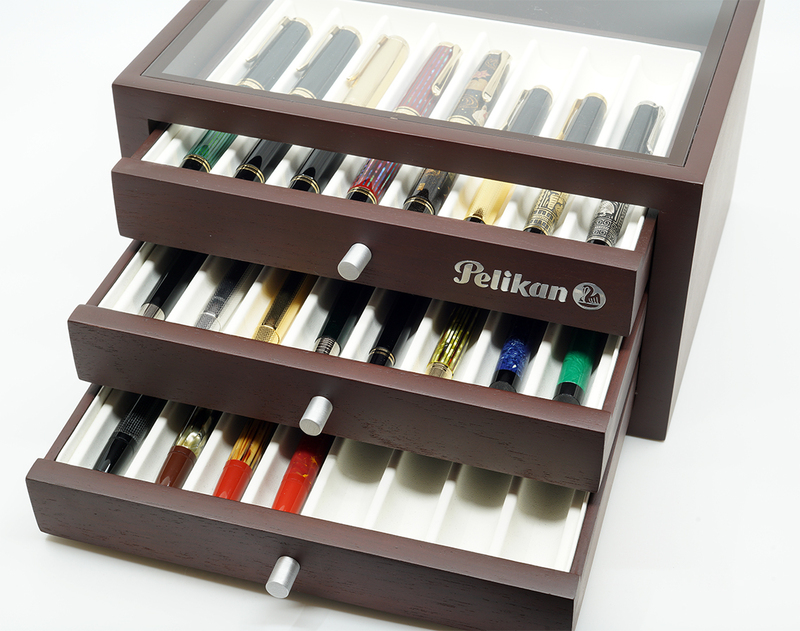 Pelikan Collectors’ Box v1.0. The arrows indicate seams visible in the lacquered paper finish. This short lived version is overall darker in color with a larger sized logo and less padding in the pen drawers. 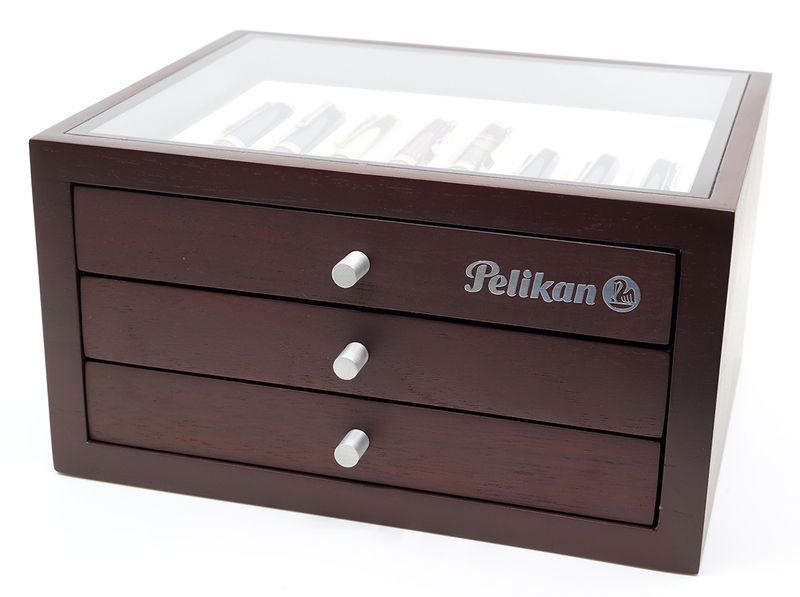 Pelikan Collectors’ Box v2.0. This new version is lighter and more reddish in color with a smaller logo and more thoroughly padded pen drawers. One final difference between the two Collectors’ Boxes is the price. The German MSRP (including VAT) for the original version was €220 whereas the newest version comes in at €270. The new pricing represents a 22.7% increase in the suggested retail price from one version to the next. Interestingly, the US MSRP price of $425 remains unchanged between the two versions, likely because there is no room to increase given the already exorbitant pricing. That MSRP gives us a US retail price of about $340. If you’re looking to own one of these, the best deals are to be had overseas where US customers can get one for around $265. After looking at the two versions of the box side by side, my original opinion still stands. These are elegant though expensive pen chests but I think that the various modifications are certainly for the better. While you can likely find a superior value for the money elsewhere, I think the small foot print and simple styling is hard to beat. The original v1.0 pen tray accommodating 8 pens. The arrows indicate bare wood, not protected by the faux leather. The new v2.0 pen tray. 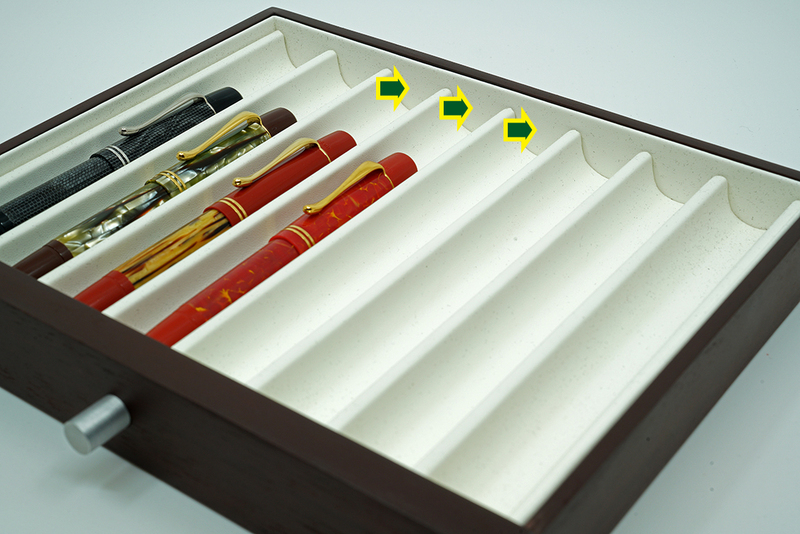 The arrows indicate the addition of faux leather along the sides of the tray, better protecting your pens from scratches. To bad they are so expensive. I am glad they upgraded the veneer to a real wood veneer from the fake stuff. I still think it is overpriced by at least $100 though. I agree with that price point. I do think that there is now some added value over the original with the addition of the real wood veneer but I still don’t think the current price is justified. Still, it’s a nice box if you can afford one. Earlier I wrote in response to your review of the original box; “I have just received my box from Niche Pens and I am very pleased with it. Quite pricy but when compared with MBs offerings it is really good value. A great box and I would recommend it unreservedly”. I have no reason to change my view of the new edition. MB offer two cases, one holds 20 pens and is of a briefcase design, it is priced around £1,060. The second case holds 64 pens and is priced at £3,977 to over £4,500. Whilst both are in a different league to the Pelikan box I cannot see how they can justify such prices. Thanks for your review. I have always wondered just how many units of each item Montblanc moves at those price points. I can’t imagine too many 64 pen cases flying off the shelves at such a premium, especially when there are at least equally nice solutions available at much more reasonable pricing. Joshua — how far do you have to pull a drawer out to safely remove a pen, particular a larger size pen, without it scraping against the drawer or case frame above it? It almost seems like a drawer needs to be pulled out completely to assure safe removal and replacement. Hello Marc, funny you asked this question because every time I take out a pen, the thought crosses my mind that I better take the whole drawer out just so I don’t accidentally dropping the entire drawer onto the floor. I was used to just flipping open the glass of my old pen box. Joshua, thanks very much for your review comparing v1 & v2. You’re most welcome. It was fun to seek out the differences. Depends on the size of the pen. I pull the drawer out until I can get my finger on the cap top and then pull up to grab the pen. If its an M1000 we are talking about, I generally pull the drawer nearly out. Not necessary for the M600 and down. M800s and up, I generally do pull the drawer out. I wouldn’t have any use for such a small case but I can definitely see the appeal of one. I imagine that it wouldn’t be cheap if Pelikan came up with it. Thanks and you’re welcome. The boxes are really nice. Thanks for pointing out the Kaweco and Lamy versions. I hadn’t seen those previously but they do look like dead ringers. I’m not sure who is manufacturing these for Pelikan. I’d be surprised if Pelikan allowed the same design to be used for other brands when they are trying to sell a product. How much space is there when putting an M1000 in there? Will this fit an ASC Arco Bologna Bronze or a Wahl Eversharp Decoband? The chest fits the M1000 easily. It can definitely handle a pen of that size or even a little larger. Since I don’t have experience with the other pens that you mention, I can’t commwnt on those.